Yup, an update. That's all it needs. "ok. I found an information here that i want to look for." Who would do that to a poor defenseless toilet!?! Oh - I was having a good day until I saw this. Now I have to go in my room and cry. what exactly is picture 7? i didnt fall in love until number 8 that ceiling is to DIE for. Oh goodness, this actualy makes the section of new jersey that I grew up in look half decent. And that, my friends is saying something! OK, I will now stop laughing and write my dissertation. Really. Now. Ehem. Well, at least people who go see that house know exactly what they are getting into! No shocks here, it's a fixer-upper. It reminds me of a house we saw on our first house-hunting trip. It was on Cherry St. and we affectionately called it "The Cherry Pit." I feel sure it was a money pit as well. WARNING: Eating a huge amount of Chili Peppers could be dangerous for your toilet. I wouldn't smoke crack in that house. I still can't figure out how a triplex gets to look like that. Did they rent to The Incredible Hulk and get him angry? Was it a crack house inhabited by destructive yet unexpectedly clean addicts? Did someone try to terminate bedbugs with extreme prejudice? Did New Jersey have an earthquake and nobody mentioned it? Maybe they ran out of money during a renovation, but that doesn't explain that toilet. The listing says NJ but it looks more like a slum in a war zone. This reminds me very strongly of a house I was shown in London by a very eager gentleman who assured us that "it would all be fine in a week, a week at most". 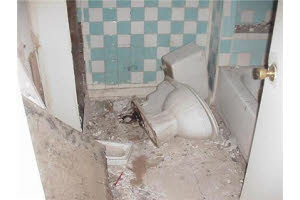 The Toilet was in a similar situation to the one seen here, only it was actually broken into three pieces, and the sink was torn out and leaning against the tub. 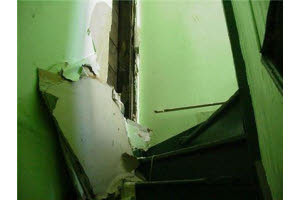 The carpet on the stairs was ripped up, but only halfway, leaving a massive pile of it crumpled in the centre of the landing-less turn, so you had to jump three steps up at an angle to ascend. Then, one of the upstairs windows was painted not shut, but OPEN, and the kitchen had three appliances that were literally unrecognisable because they had apparently been beaten by the Hulk on a very, very bad day. I honestly have no idea what they were other than the oven, which was identifiable because of the crushed gaping hole missing a door of any sort. Thank you, for bringing back this memory. It deserves to be visited more often.